I had this things so looong on my WL. 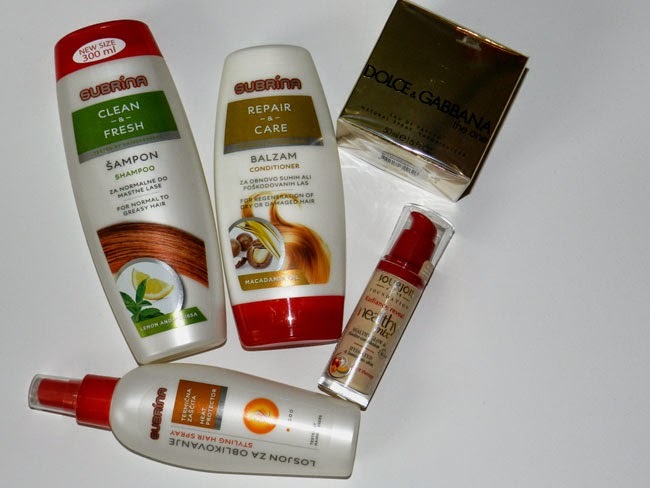 And I am talking about Dolce&Gabbana The one perfume and Bourjois Healthy mix foundation. But somehow there were always other perfumes that I get and other foundatoins that I pick. Maybe because I owned both of this ages ago. And I am always on a market for new things. Ages ago, when it just came out, I run screaming to get this foundation that suits all pale faces around the world. This was a first shade of foundation suits me perfectly, and by the time I run out of it they came up with the new formula and a little darker shade. And I was really sad about that. So I bought another new foundation instead of this one, and fall in love with the other one, till some day the blogger area was full of gorgeous reviews about the new healthy mix. Yes that was the day I new that this will be mine some day again. And that day came. I am super excited to try this one again. I am sure I will write some more about this one really soon... to be continued..
And there is another thing I was craving about. Slovenian brand Subrina, refresh the formulation for their hair care line to a better one, and since I've heard the news, I know this will be my new shampoo and conditioner. And when the opportunity for free stuff showed up I was first in line :) I picked cleansing shampoo, and repair balsam for my hair. And of course the heat protector. Stay tuned for a review. I can say that everything smells so goooood♥. If you are from Slo defenetly go check this new line in stores! And after a long, long time a haul post, hope you enjoy seeing all the goodies I bought or get this days. Maybe I will post some more about my new things if you would like to see it.